After you adjust your monitor color by using a hardware profiling system, your next step is to choose your color workspace. 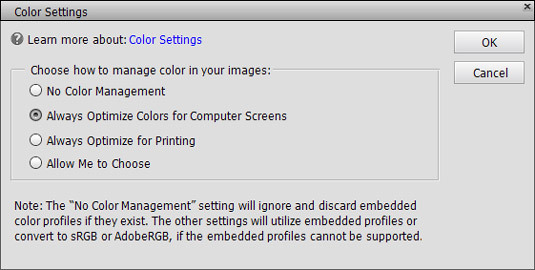 In Photoshop Elements, you have a choice between two workspace colors: either sRGB or Adobe RGB (1998). You access your color workspace settings by choosing Edit → Color Settings. The Color Settings dialog box opens. The Color Settings dialog box. No Color Management: This choice turns off all color management. Don’t choose this option for any work you do in Elements. When using No Color Management, you need to work with files that have color profiles embedded in the photos. Most likely you won’t use these types of photos. Always Optimize Colors for Computer Screens: Selecting this radio button sets your workspace to sRGB. sRGB color is used quite often for viewing images on your monitor, but this workspace often results in the best choice for color printing, too. Many color printers can output all the colors you can see in the sRGB workspace. Always Optimize for Printing: Selecting this option sets your color workspace to Adobe RGB (1998). The color in this workspace represents the best color you can see on newer monitors, as well as many of the newer inkjet printers. As a default, this is your best choice. Allow Me to Choose: When you select this option, Elements prompts you for a profile assignment when you open images that contain no profile. This setting is handy if you work back and forth between screen and print images.